Steven Moyers was given his first loss of the year in a 10-6 LumberKings loss to the Burlington Bees. Burlington, IA (August 21, 2018) - A pair of five-run rallies by the Burlington Bees proved too much for the Clinton LumberKings to overcome in a 10-6 loss on Tuesday night at Community Field. The loss is the LumberKings (25-33, 64-64) fifth straight and drops them to a 500 mark for the season. Steven Moyers started for Clinton and was given the loss for his five innings of work. He allowed the first of the five-run rallies to the Bees (18-36, 48-75) in the bottom of the third inning. The Bees scored their first runs of the game in the third, batting around against Moyers (4-1) to tally five runs on five hits in the inning. Of the five runs allowed by Moyers three were earned as he surrendered eight hits and did not walk a batter while striking out five. 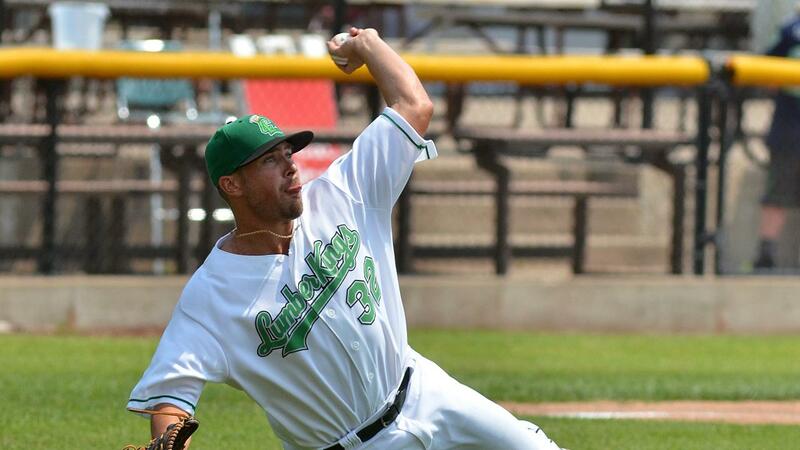 The LumberKings held a brief 1-0 lead following a bases loaded walk by Ariel Sandoval in the top of the third and then struck for three runs in the top of the fifth against Burlington starter Oliver Ortega. Clinton batted around in the fifth to pull to within one. The second LumberKings bases loaded walk of the game pushed across the first run in the fifth and Juan Camacho punched a two-run single through the left side of the infield to make it 5-4. Ortega was followed by Eduardo Del Rosaio (3-4) who turned in 1.1 innings of relief work to earn his third win of the season. Burlington pulled away with another five-run frame in the bottom of the seventh. Kenner Pina had the big hit of the inning, clearing the bases with a three-run triple to right center field. Clinton rallied for two runs in the top of the ninth. A leadoff walk to Zach Scott was followed by an Ariel Sandoval RBI double off the wall in left center field. Camacho then scored Sandoval from second with his third hit of the night, an RBI single to right center field. The LumberKings will meet the Burlington Bees for the second game of their three-game series on Wednesday night. Clinton will throw right-hander Clay Chandler (8-3, 3.94) while the Bees will counter with righty Austin Krzeminski (5-5, 2.01). Game time is slated for 6:30 PM. Fans looking to listen to the game can hear Erik Oas on the call on 100.3 FM WCCI and online at lumberkings.com via the tunein radio ap at 6:15 PM with the pregame show.